Anti-British sentiment in Africa had run high after the French battleship Richelieu had been hit in the port of Dakar, Senegal, in French West Africa on July 10, 1940. In August, Free French General Charles de Gaulle suggested an overland campaign, landing at Conakry, French Guinea. He anticipated that popular support for the Free French movement would be built in a drive on Dakar. But de Gaulle's suggestion was overruled by British desires to move swiftly. On 18 September, three French light cruisers, the Georges Leygues, the Gloire, and the Montcalm were intercepted by Allied ships en route to Libreville. The intercepting Allied ships included the heavy cruiser HMAS Australia. The three French light cruisers were forced to retreat. Vichy resistance stiffened as a result of the attacks on the French ships. The Battle of Dakar (23 September to 25 September 1940) took place after Allied forces failed to persuade the Vichy French defenders of Dakar to allow them to peacefully enter the city. The Allied forces first tried to persuade the Vichy forces by means of propaganda. They then attempted to take Dakar by force of arms. Both attempts ended in defeat. Allied hopes of taking over French West Africa were dashed for the time being, leading to the less developed and economically important French Equatorial Africa to be the main Free French territory in the immediate aftermath of the Armistice. ^ "The Second World War in the French Overseas Empire". Retrieved 2006-02-27. Akpo-Vaché, Catherine (1996). L'AOF et la Seconde Guerre mondiale: la vie politique, septembre 1939-octobre 1945. Paris: Editions Karthala. ISBN 9782865376407. Ginio, Ruth (2008). French Colonialism Unmasked: the Vichy Years in French West Africa. Lincoln: University of Nebraska Press. ISBN 0803217463. Smith, Colin (2009). England's last war against France : fighting Vichy 1940-1942 (1st ed.). London: Weidenfeld & Nicolson. ISBN 9780297852186. Tute, Warren (1990). The Reluctant Enemies: the Story of the Last War between Britain and France, 1940-1942. London: Collins. ISBN 0002153181. 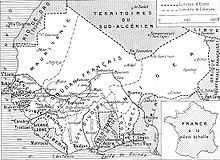 Wikimedia Commons has media related to French West Africa in World War II.